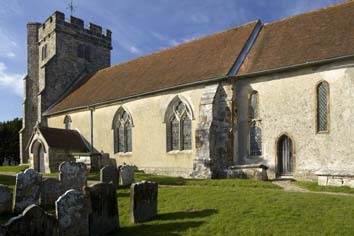 The nave and chancel are C13 and the north aisle and most windows C14, with a C15 tower. There is a C18 squire’s pew, a monument attributed to Rysbrack and a C15 brass. 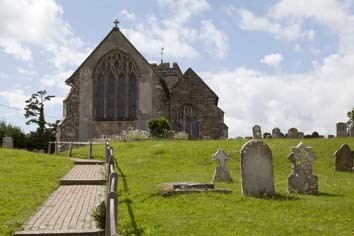 Warbleton church stands on a hill with fine views towards the Downs. 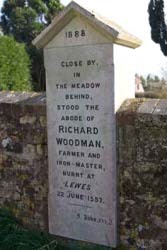 Richard Woodman, ironmaster and a ‘Lewes Martyr’ of 1557 (2 p165), is said to have lived in a house that stood within what is now the churchyard and is now marked by a modern memorial. Today, the village in the immediate vicinity of the churchyard is confined to a row of cottages and a pub. The nave and chancel of the church are built of local sandstone, but they are mostly rendered. 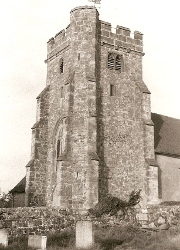 The oldest work is C13, particularly the chancel, with two south lancets and a chamfered doorway (renewed). The chancel arch has stops and a double-chamfered head, of which the inner order rests on moulded corbels on the square chamfered responds. It looks early C13 and though nothing in the nave is obviously of this date, the Burrell Collection drawing (1782) shows a small blocked round-headed window, east of the south porch, perhaps now hidden under the render. A south west lancet has a trefoiled head, which would mean it was little earlier than 1300, but it is too renewed to be relied upon for dating purposes. Most detail is C14. The tracery shows a progression, which can be accommodated within a single building campaign that included a gabled north aisle and lower chapel. The square-headed north window of the chapel is blocked by a monument inside (see below); those of the aisle are segmental with pierced spandrels. 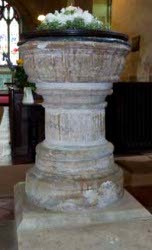 The four-bay arcade has octagonal piers on square bases and heads with two hollow chamfers, as do the arches into the chapel from aisle and chancel, though the capitals of the latter are cut into, probably for the later screen. The chancel was given an east window that combines curvilinear elements with straight mullions and panelling, so it is later C14. The east angle-buttresses and wagon roof, which is panelled with moulded transverse ribs, also date from then. The segmental north window of the chancel is linked to the aisle, but the panelled tracery is later in form. 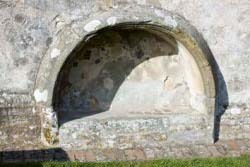 A broad trefoil-headed light in a square frame below the south west lancet is a lowside, whilst an adjacent two-light window with a trefoil in the head and a rounded tomb-recess beneath is, though comparatively conservative, no earlier. The nave has a single trefoiled south west lancet and a low stone porch, with a mostly renewed moulded arch, like the doorway. The C15 east window of the north chapel has a depressed head and mature panelled tracery. There seems to have been no tower until one was added at this date. The tall tower arch, the head of which has two chamfered orders, with the inner one on corbels, reveals that it is at a distinct angle to the nave. Unusually, the south west angle-buttress incorporates an octagonal stair, so the west bell-opening has only one light, though the others have two. There are a moulded west doorway, a three-light window with renewed panelled tracery and a corbel-table of grotesque heads below the battlements. The lower entrance of an early C16 rood-stair is south of the chancel arch, with a corbel above for the rood beam. Post-Reformation changes included two windows east of the south porch with intersecting tracery in the Burrell drawing, which do not look old. In the north aisle a large manorial pew, dated 1722, is raised on pillars and affords an excellent view over the whole church. It was originally lit by a square opening shown in the Sharpe Collection drawing of 1804. 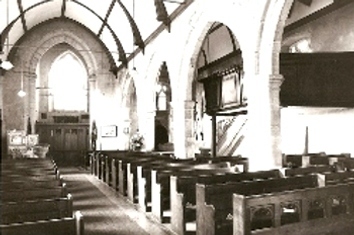 Such pews are rare survivals and its retention shows, as do other signs, that the C19 treated the church fairly gently, despite some renewed external stonework. The restoration of 1882 by W O Milne (WSRO Ep II/27/248) concentrated on the chancel (BN 43 p707). He may, however, have replaced or repaired the nave roof, though that is plastered, hiding the main timbers. The two later south nave windows were replaced by ogee-quatrefoil ones of earlier C14 pattern and at the west end of the aisle is a vestry. Repairs were carried out in 1962 under D Clarke of J D Clarke and Son (ICBS). Brass: (Chancel) William Prestwick (d1436), rector and also rector of St Mary, Hastings (Mosse p153), though he was primarily a royal official (Saul p198), which no doubt accounts for the size and form of the brass. Vested for mass, he lies under an ogee-headed canopy with a pelican in its piety as the finial. At the corners of the marginal inscription are the symbols of the Evangelists. Though damaged, it is a fine example of the D Series (see London workshops). Chest: (North aisle) Iron-bound with a domed top, probably C14. 1. (First stage of tower and thus inaccessible) C16 iron, with complex levers, so perhaps intended for a strongroom. It is traditionally ascribed to Richard Woodman (2 p164). 2. (North aisle doorway) C14, of wood. Font: C13 round bowl on a simple stem; both base and stem are deeply moulded. 1. (North west aisle and chapel east window with some also in the north chancel windows) C15. There are quarries with small depictions of a bird (probably a duck or goose) and a fox being hanged on a gallows. 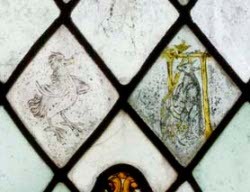 There is also some heraldic glass and two angels in the head of the east window of the north chapel. 2. 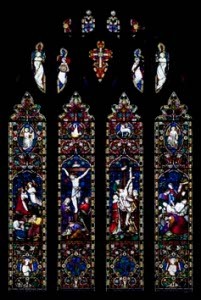 (East window) Horwood Brothers of Frome, 1872 (B 30 p332). The colours are dark and the scenes small in scale, so the glass is old-fashioned for the date. 3. (West window of tower) C E Kempe, 1882, and very different to most of his work. The single large design, though rather cluttered, allows no room for his usual ornamented borders and the whole testifies to his interest in late mediaeval German and other continental glass. 4. (North aisle, first and second windows) J Hall and Co, 1922 (CDK 1929 (advertisement for one; the other is an obvious pair)). The first one is largely hidden by the manorial pew. 5. (South chancel, first window) Burlison and Grylls, 1930 (CDK April 1930). 1. (North chapel, behind the organ) Sir John Lade (d1722) by J M Rysbrack (Gunnis p338, but not in Roscoe). It is in various coloured marbles, with Corinthian columns and a pediment around an expressive bust. The views of the deceased on the religious and political issues of the day are given on the inscription. A native of the parish, he leased the manor in 1717 (VCH 9 p206) and probably erected the pew. 2. (North chancel) John (d1688) and Anne (d1722) Roberts. Draped cartouche with cherubs. 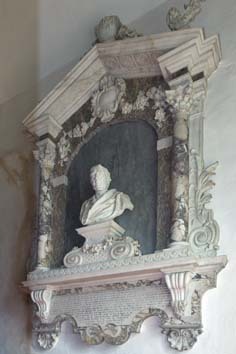 Anne was the aunt of Sir John Lade and the monument dates from after her death. It is similarly of high quality, and has been attributed to E Stanton and C Horsnaile (BE(E) p654). 3. (Nave south) Thomas Roberts (d1638) with scrolled pediment, attributed to M Colt (ibid). 4. (Churchyard north east) John Fox (d1815) by J Harmer. 1. 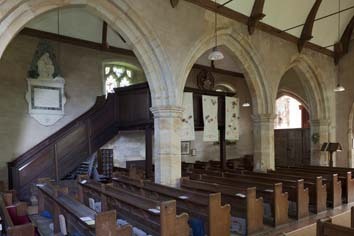 (South chancel) C13, with very plain mouldings. 2. (South east nave) Chamfered with a pointed head. Probably C13. 3. ((East respond of arcade, chapel side) C14 moulded and pointed. 4. (North chapel) Plain and pointed, this must be C14. 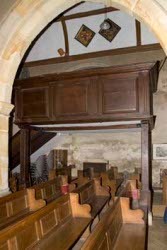 Pulpit: The arched panels suggest it is C18. Recess: (Chancel south side outside). This low recess is almost certainly connected with a tomb. Despite its round head, there is no reason to doubt that it is C14. There is something similar though larger at Sutton, West Sussex. Reredos: There is currently (2012) no reredos, just bare stone on the east wall, but there is a record of one that was new in 1890 (CDK 1890 pt 2 p157) by Heaton and Co, i e Heaton, Butler and Bayne. 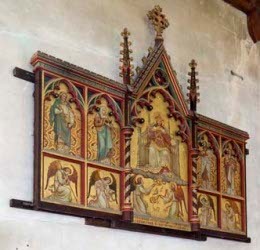 This is said to have been of oak and it is probable that the painting of Christ in Majesty with attendant saints and angels beneath, in the south west corner of the nave and in memory of someone who died in 1886, is at least a part of it. It is in the then fashionable early Italian Renaissance style, painted on a gold ground. Sedile: (South chancel) C13, pointed and chamfered with stops at the base. My thanks to Nick Wiseman for the colour photographs and additional information about the glass and other fittings.